Greetings, friendly readers and minds inquisitive about Durham Priory’s manuscripts and early printed books! 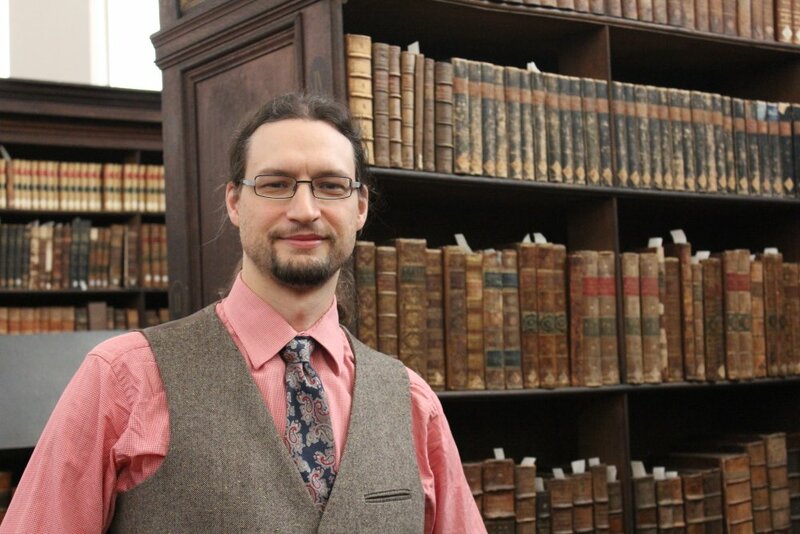 My name is Matthew Hoskin, and I am a new postdoctoral research fellow here in Durham, the Barker Priory Library Research Fellow. I’ll be posting on this blog every once in a while alongside Elizabeth and the Digitisation Team. I come to Durham after several years in Edinburgh where I did an M.Th. in Ecclesiastical History and a joint Ph.D. in Classics and Ecclesiastical History and spent time as a Teaching Fellow. The focus of my previous research was the manuscript tradition of Pope Leo the Great’s letters (pope, 440-61) and other early papal letters (particularly of Siricius, Innocent I, Zosimus, and Celestine I). Papal letters being one of the main sources and foundations of canon law, and our manuscripts for these Late Antique bishops of Rome being mediaeval, when I saw the quantity of canon law manuscripts associated with this project, I knew this was somewhere I wanted to be. So I’ll be spending the next 11 months researching Durham Priory’s canon law manuscripts. These run from a copy of the Collectio Lanfranci brought here by the priory’s (re)founder, William of St-Calais (Bishop of Durham, 1080-96) to a printing of papal decretals from 1527. My own interests running earlier, I am starting my research with William of St-Calais’ canon law manuscript and its relationship with the copy that belonged to Archbishop of Canterbury Lanfranc of Bec (archbp 1070-89) — as well as the (not always rosy) relationship between these two men. That means that Elizabeth and I bookend the life of the priory — I’ll cover the beginning, and she covers the end! It will be an exciting year. Keep an eye on this space!